To See the FULL Updated List of Amazon Canada Deals, Please Click Here!! just did after removing figs and loose parts of build (4 sled type thingies). only heard the hook, no loose pieces. Well it looks like I have one to build... Is this something you guys would contact Amazon about? It definitely happened in shipping since the outer box matches the inner. I gave my boxes a shake and didn't hear any lose pieces rolling around pseudoty. oh wow. mine are mint compared to that. I would contact amazon, you likely can get a refund. I haven't dealt with Amazon with an issue like this before. Will they only do a refund or would an exchange/discount be an option they would entertain? Mine was delivered this morning and is almost minty with very minor scuffs to one corner and dusty with 27R4 seals. Perhaps Amazon likes Vancouver buyers better! Mine had the same seal codes 27R4, wonder if the damaged ones were older. Anyone have one handy they can tilt around and let me know if you hear a small piece rolling around in there? The box consists of 17 bags and 1 white box (with 7 bags) plus the heavy instruction book with stickers. There are no loose pieces, at least not in the box I opened to build. Thanks for your help. I went to open it to verify and noticed the seam on the front of the box at the bottom was not glued for about 10 inches. 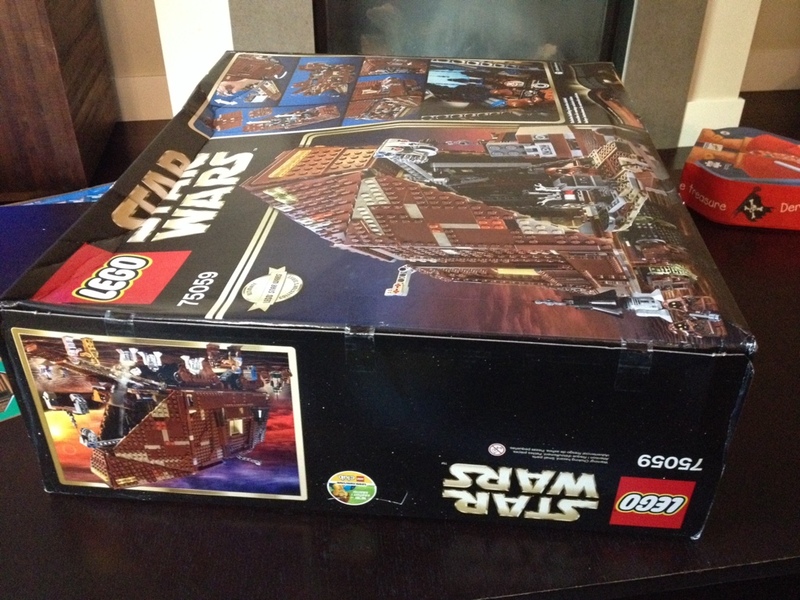 Lots of loose pieces inside but the bigger white box that has c3po in it appears sealed so not sure what to make of it. How did you contact them and what did you say? I have one with a pretty decent size crease from someone stacking stuff on it. Was considering returning it but would keeper if they discounted it a bit more. Why would you return it? Can you get it for 28% off from another source? I was planning on reselling on quickly and they other later. Both have damage but the one is question is pretty beat up. Like they had stuff stacked in the middle of the box and it caved a portion of it in. On both boxes the corners are very worn and the one with the crease has on really crunched corner too. None of this happened in shipping though because the box they came in was perfect. Ok I just contacted them. The service was actually quite good. I really have never had to deal with them for with this type of an issue and it was painless. They dropped 20% off the cost which was fair since both were damaged but only really one was of real issue. The other was passable. They offered an exchange as well but I have no idea how I would fit that box in my car to drop it off as it was very large. On exchanges would they have picked up too? this is why i stopped ordering large sets online, it just isnt worth it. at least you got another 25% off and you can build it, thats a bonus. Lol yes probably! Someone selling on craigslist for 325. Grab that and sell on ebay for 325USD plus shipping. 10% ebay fees, 1.31 CAD to 1 USD, subtract 10%, still a 20% gain. I agree, $325 is still a good price. I wouldn't be flipping these though. I think they will do quite well after EOL. I received my final two and one of the boxes was quite bad. It also had a sticker with some code with amazon.com under it. It basically gave me enough reason to open one up and build it. I received 20% refund for the final shipment. My final price was $225 each after tax for the sandcrawlers. On top of that my CC is 1% cash back and I got ****** discount of $12 too so closer to $215 each after all is aid and done. I think people would totally be put off by the cost of shipping. The thing is HEAVY. Don't think there will be much to gain after that. If you haven't built one of these, you are missing a lot of fun. Out of all the sets my son and I built, this one is one of my absolute favorites. Some of the design details are just well done, and very well thought out, especially the back portion, and upper plates. I personally think it looks great displayed. I ended up getting 20% off my smooshed sandcrawler. At first they didn't offer a discount, only a refund or exchange. When I said I'll take an exchange, all of a sudden they didn't have any in stock and offered the 20% discount which was good with me. I'm wondering if this was a tactic on their part to see if I was just trying to get a discount or if I'd really go through with the exchange/return? ?